The long-expected official report on the collapse of the mezzanine deck on Wightlink’s St Helen ferry has been released. It’s stark reading, exposing long-running failures to conduct maintenance, despite being made aware of issues. Wightlink apologise. 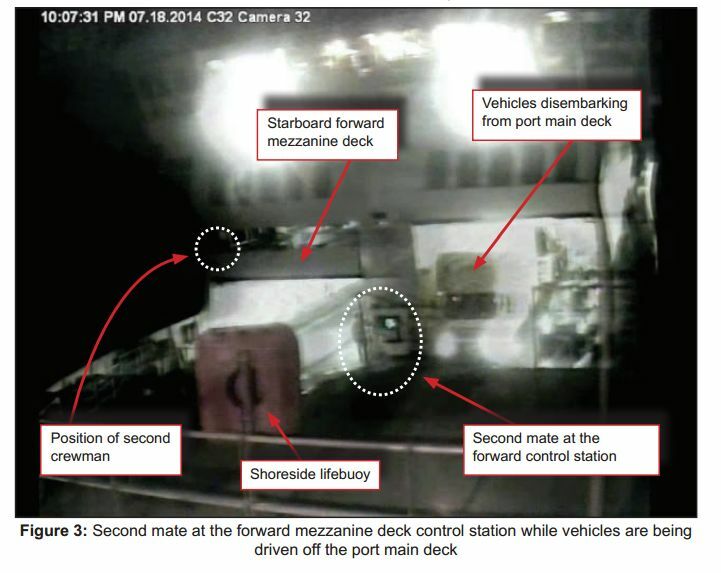 The Marine Accident Investigation Branch (MAIB) has published its report into the collapse of the mezzanine deck on Wightlink’s St Helen car ferry that took place in July 2014 and made worldwide news. The report lays out long-running maintenance failures that led to the incident, which resulted in injuries to passengers and staff – a crewman was knocked unconscious – as well as damage to vehicles. Wightlink was aware of many of the safety issues and contributing factors highlighted in this investigation report. 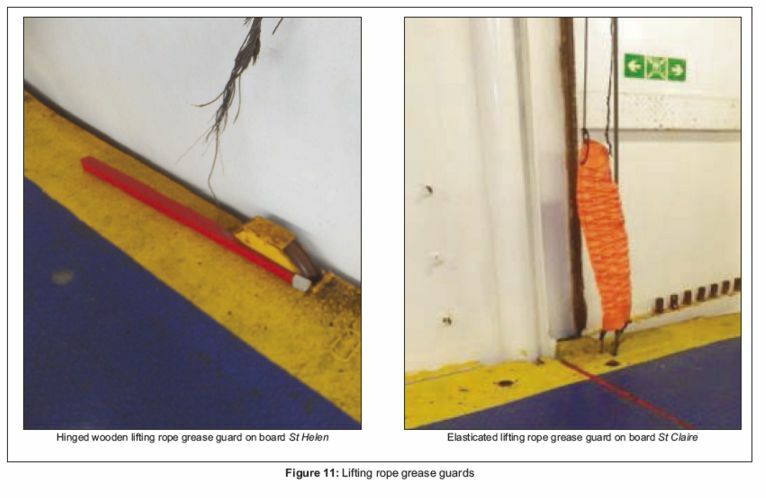 Of note: the absence of a formal mezzanine deck greasing routine had been subject to an internal safety management system non-conformity for over 2 years; the failure to address the non-conformity was highlighted by the Maritime and Coastguard Agency 9 months prior to the accident; and the failure to lubricate the steel wire lifting ropes was identified during 6-monthly examinations. Given this knowledge, and the potential consequences of a rope parting, Wightlink demonstrated little or no appetite to allocate the resources necessary to resolve this long-standing issue. This apparent lack of impetus was probably influenced by an over reliance on its 4-yearly wire rope replacement program and the Royal & Sun Alliance Engineering Inspection & Consultancy and the Maritime and Coastguard Agency’s reluctance to escalate the issue. St Helen’s mezzanine decks had not been maintained in accordance with the equipment manufacturer’s instructions. This allowed the material condition of the collapsed deck to deteriorate to a dangerously unsafe condition. Wightlink’s mezzanine deck greasing routines had fallen into abeyance and their steel wire lifting ropes had not been routinely dressed and lubricated over many years. Wightlink’s maintenance management system had weaknesses in key areas. In particular: maintenance roles and responsibilities were confused, record keeping was inconsistent and time was not allocated for the conduct of some essential maintenance. One of the collapsed mezzanine deck’s main structural beams failed on impact with the main deck. 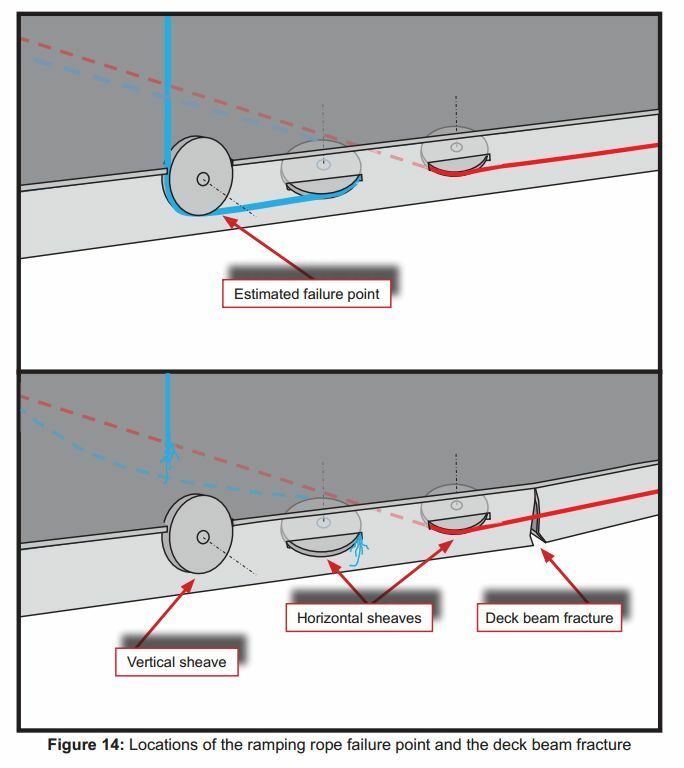 The beam failure occurred at the site of a previous fracture that had been repaired to a poor standard. 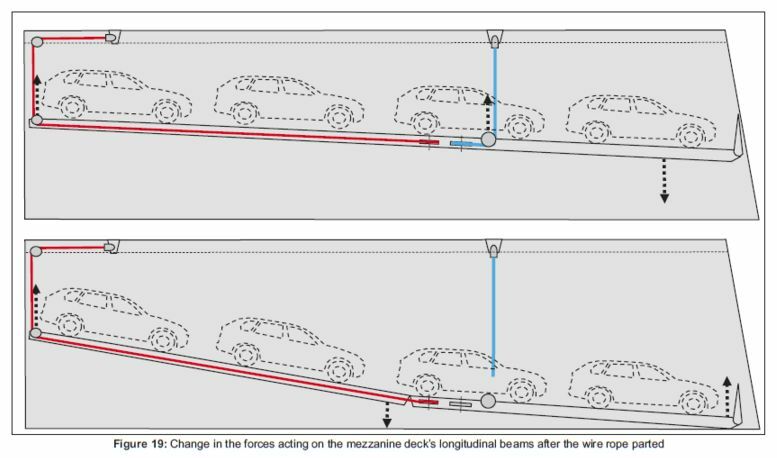 The previous weld repair to the mezzanine deck’s failed beam had not been subject to formal approval and had left the deck in a structurally weakened condition. 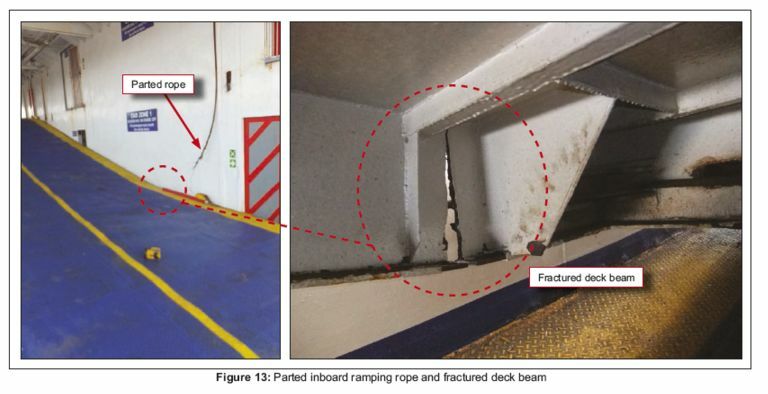 Wightlink was aware that its mezzanine deck greasing routines had fallen into abeyance; the maintenance shortfall had been subject to an internal safety management system non-conformity for over 2 years. Wightlink’s appointed lifting equipment surveyor repeatedly observed that the lifting wires for Saint Class mezzanine decks had not been dressed and lubricated. Given the previously identified potential catastrophic consequences of a lifting rope failure, the surveyor and/or his employers, Royal & Sun Alliance Engineering Inspection & Consultancy, should have elevated the recurrent report observations to a safety critical deficiency. Wightlink, who say they cooperated fully with the MAIB investigation and entirely accepts the recommendations of its report, also say they have has already implemented all of the MAIB’s recommendations. “We apologise for the injuries caused to customers and staff that night at Fishbourne and for the damage to customers’ vehicles. Immediately after the incident we took all necessary measures to check and confirm that the mezzanine decks on our other vessels were safe for use. The mezzanine decks on St Helen were not used again and the ferry was sold to another operator in March 2015. 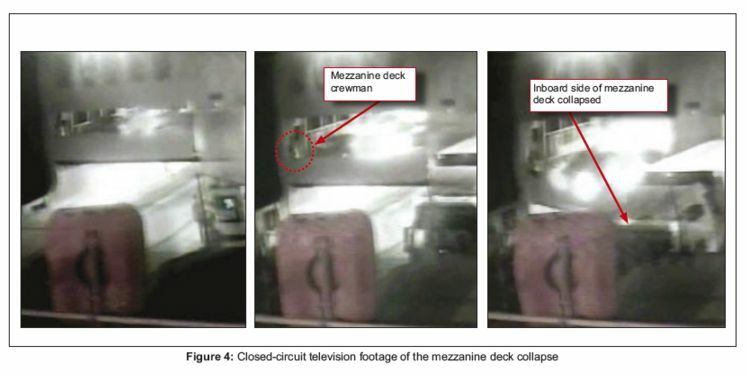 The following images (© Crown copyright) are from the MAIB Report on the investigation of the collapse of a mezzanine deck on board the roll-on roll-off passenger ferry St Helen Fishbourne Ferry Terminal, Isle of Wight on 18 July 2014 (embedded below). OnTheWight has given you a summary of the finding above. To get the full picture please see the report embedded below. Click on the full screen icon to see larger version. 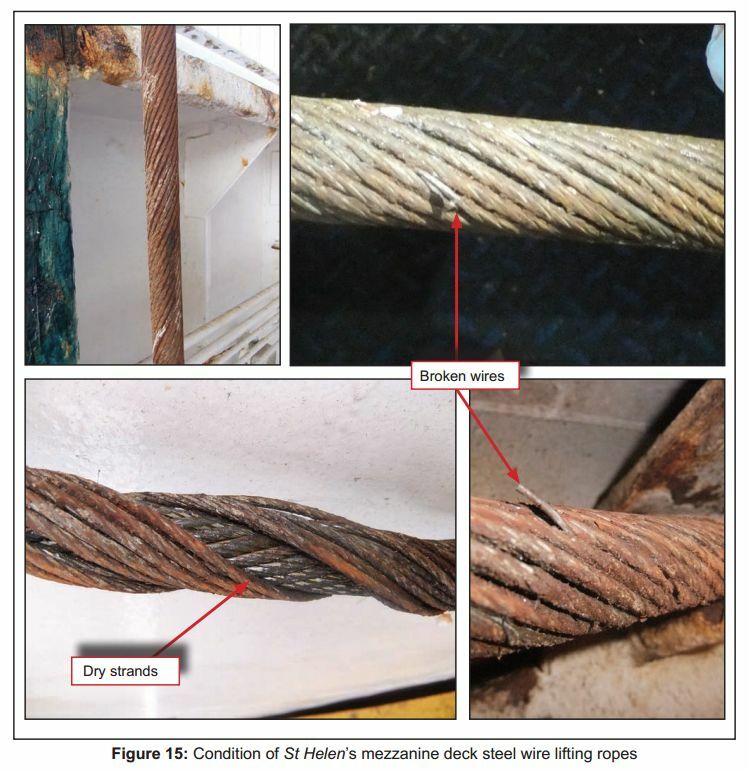 30 Comments on "Wightlink’s collapsed deck: Lack of maintenance allowed cable to ‘deteriorate to a dangerously unsafe condition’ says official report"
No surprises here, but a shocking report. It leads one to question general standards of maintenance in other area of the Wightlink fleet. That’s a fairly shocking report. The management were aware of maintenence issues and did nothing. Why is there to be no legal action taken aginst the managers responsible for not ensuring the vessels safety? And the boss took three quarters of a million a year for this brilliant management? That gives little confidence to know that’s 2 years of neglect at the root cause. Really hope the company are truly committed to maintenance in the future. Interesting to learn what the Health & Safety Executive – HSE – make of this management negligence and at what stage would corporate charges be brought. It would be interesting to know if the St Helen is maintained to a better standard in Italy. Does OTW have any connections with the local press in that area? Who was the operations director at the time of the incident? Who has lost their job? Personally I have for the last 3 years boycotted Wightlink because of their prices, their arrogance and the condition of their boats, when I last used them. If more people could boycott them we will see a different approach. In addition, none of the lifejackets provided for your safety have a self igniting light on them-as required by SOLAS, but not required because these vessels operate in Cat D waters. This could result in a catestrophic failure in the event of abandonment-but is legal….for now. We should expect full (voluntary) compliance from these companies on issues of safety. I believe it was reported there were no vehicles under the mezzanine floor when it collapsed. There is a large truck disembarking on the other side of the ferry, are you confusing it with that perhaps? I was looking at the sequence of 3 pictures and mistaking the sign in the foreground for a vehicle – I stand corrected. However, I still believe this incident could have been far worse. It was a lucky escape! Another good argument for a nationalised, properly run and regulated, not for profit, integrated, national transport service. Cheaper, safer, and better for our ailing environment. Realistically Frank James – when do you think that is going to happen? That’s a genuine question. Do you actually believe that any Government is going to support that option? Horrible firm, dreadful overpaid people with no connection to Island life whatsoever. Remember how they kept increasing the fares, several times a year when the cost of fuel increased? How often did they cut fare prices when oil fell? As if you couldn’t guess. Quite simply, ferries have massive maintenance costs and issues…many moving parts to go wrong that are in a highly corrosive environment. These disadvantages when compared to using a fixed link tunnel are massively expensive and can be dangerous. Automated toll tunnels have very few moving parts which are not subjected to a corrosive environment……ferries to the IOW are 19th century technology in a 21st century world. … and let’s remember that their costs will increase when the oil price rises. Talking about maintenance of the ferries does anybody know why the St Claire has been down at Falmouth docks since the 6th of January 2016? OTW were given a resignation letter from a Wightlink Chief Officer, but refused to publish in case it damaged the Island’s reputation. It was all to do with safety-there is more to this story. If you don’t like it move. 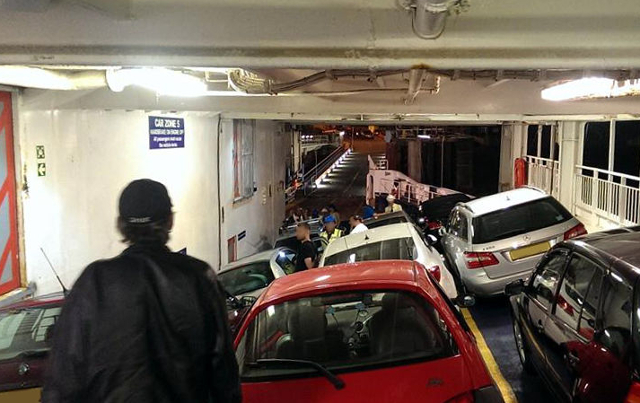 You live on an Island so you have to accept that there are some issues when using vehicle ferries. Most people don’t care they just get on with it, we provide a service and you pay for it. It’s a business and we will continue to increase profits as much as possible, there’s nothing you can do about it. What a pathetic comment from a Wightlink ‘spokesman’. Says it all!